Like what I said,I shutted down my nextgen topic(Not really,I just locked it)for no more enough places to put everyone's nextgen takes.Also,I tried to solve the problem but it didn't work. So I decide to start a new topic! 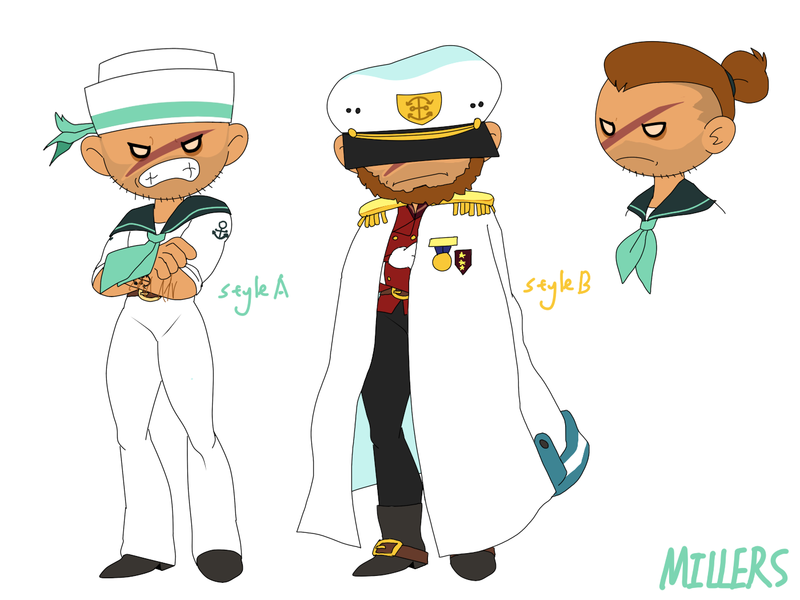 !I won't put this in Fan Art board because it disturbs. Here,I'll show you my ideas which suppose the offsprings of the gameria customers!It's a fun activity,so why not hop in!,it can also show you how much do you love the official shippings,I guess. 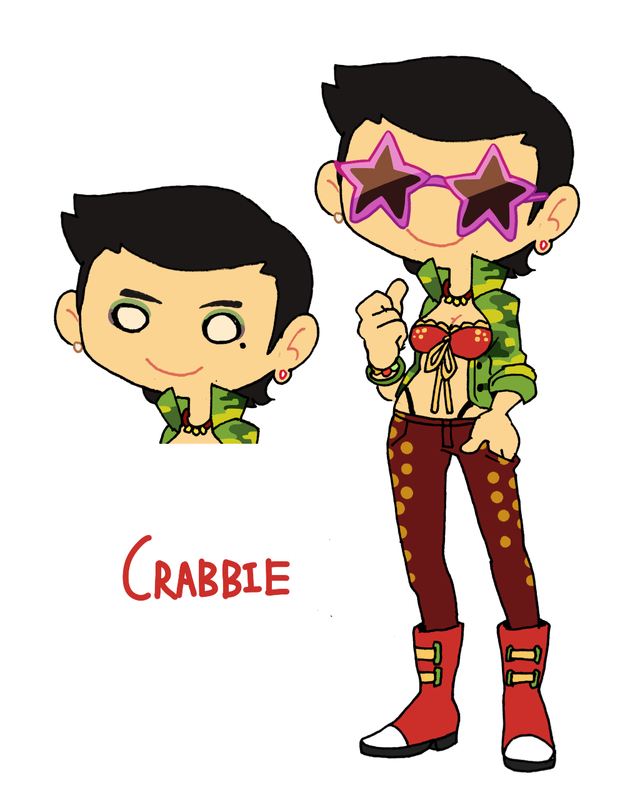 If you have any suggestions for customer shippings,shout out here please!Or,post your creative descendants,we could discuss about him/her. 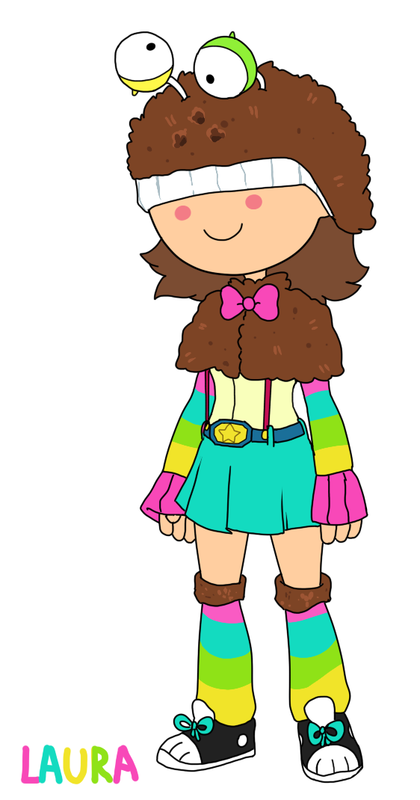 Alice is one of Alberto&Penny's twin daughters.By her father's impression,she became brave,and always acts like a boy.What a tomboy!Usually,she helps the members in Alberto's soccer team,Freezeria Swizzers,and she hopes her dad and his team win a cup in the future.At times,she also goes to library to have a knowledge-surf!Her best partner,Rodney,who is also a crazy soccer fan,is looking forward to wanting Alberto to be his mentor because of his obsession to soccer,so Alice plays an important role to improve Rodney's ability.She takes cares as much as she can of her another twin sister,Jenny. 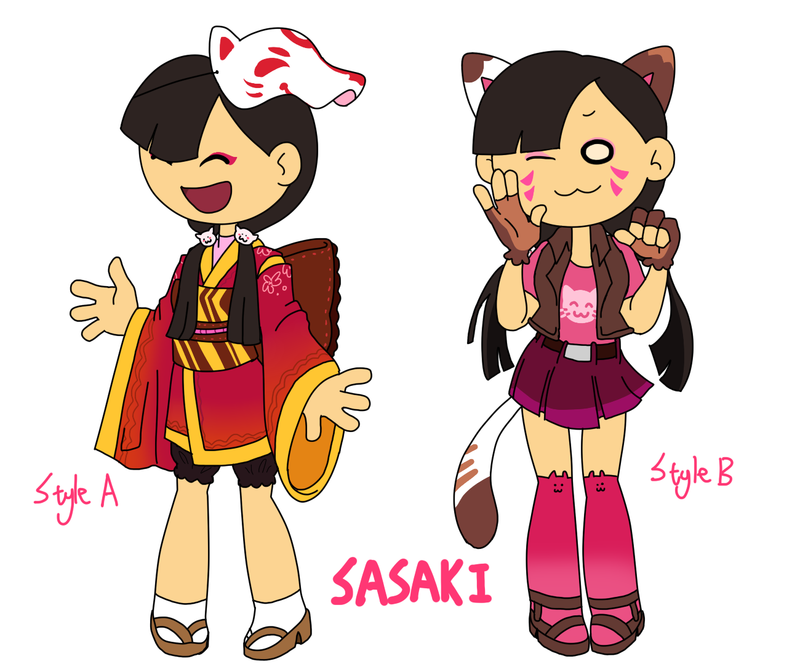 Extra: One time,Alice went to Starlight City for the wonderful acrobatic show who was acted by the famous acrobatics,Akuma and Comet Con,soon she recognized she fell in love with Akuma.From then on,she looked for many info and magazines about him.Akuma became her boyfriend for some easy reasons. 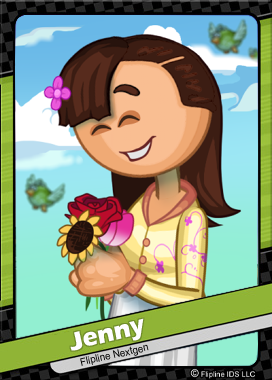 Jenny is one of Alberto&Penny's twin daughters.She's a really silent and shy girl,who's very afraid of many kinds of breathtaking activities in real life.However,she enjoys the nature!In her most spare time,she spends time in making friends with the foodies and picking some flowers on greens.Sometimes she chooses to eating out with her best partners,Ruth and Sasaki,or just taking a walk with her most adored guy,Chad.What also she likes to do is to depend on shoulders of her another twin sister,Alice. In Alice and Jenny's family,there were a forgotten little boy.He is called Elliot,who is sent to Eclair Academy for his long time studying with accommodation.To solve the problem of Elliot's speechlessness and loneliness,Alberto and Penny had a family discussion.Finally,Elliot started his long school life at his age of 7.Time flies,day by day,Elliot became braver and happier.However,Elliot has stepped in his puberty,he always acts like a rebel.Although neighbors all dislike Elliot's bad personalities,the whole family still give their best care for him,especially his twin sisters.Elliot has a big dream,which he is going to be a baseball player.He hopes he can play for Calyspo Island Coconuts. 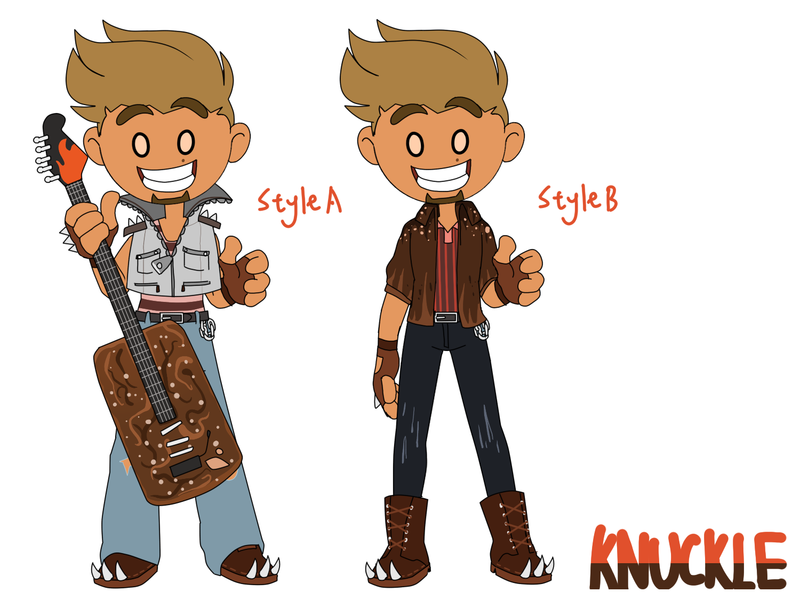 Knuckle has a passionate dream of music!With his pursure,he finally formed a music band called Fudge and Furious.In the band,he plays a role as the main guitarist,and he's always the person who leads the band.As long as there's a chance for a concert,he must catch it,because he knows it's not easy for all people to appreciate his music style.Even if Orchid and Blazebella's love action might drive him crazy,he's still happy about teaming up with these musicial girls. 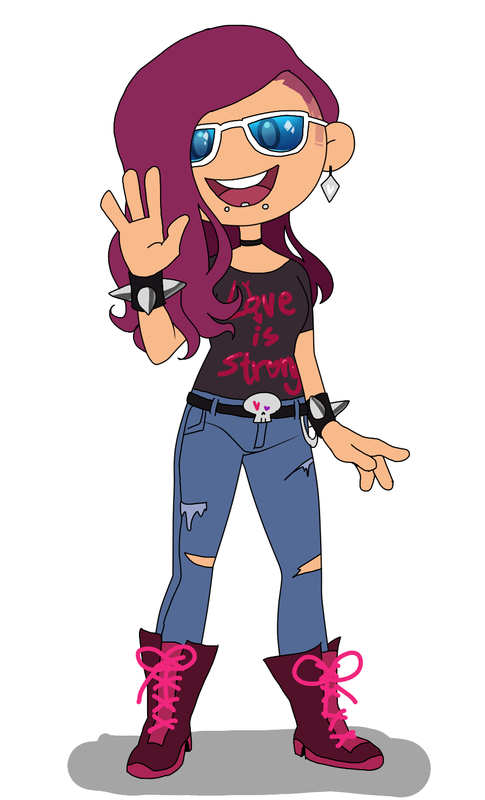 Orchid is deeply inspired by her parents' music style,Ska-punk,so she decides to live in the music career,and come into the music element.She joined her music fellow,Knuckle's music band,be a role as a bassist,and she plays her music strength very well.Afterward,she met Julieta,who was down for her underrated electronic music in Warped Records.She tried to cheer Julieta up,slowly and slowly,both girls got alone well with each other.However,they fall in love with each other just for they have something in common. Blazebella is an unpopular electronic music artist who's struggling for her music life.She wrote lots of wonderful music,but few people appreciate her.Despite she can turn to the famous DJ,Hugo,she didn't do that at last.Since Fudge and Furious became known,she has been in it in order to help Knuckle&Orchid to tune their music.As a result,more and more fans appreciate Blazebella's music.When people just know Blazebella is actually Hugo's talented daughter,Julieta,they're all deeply amazed. 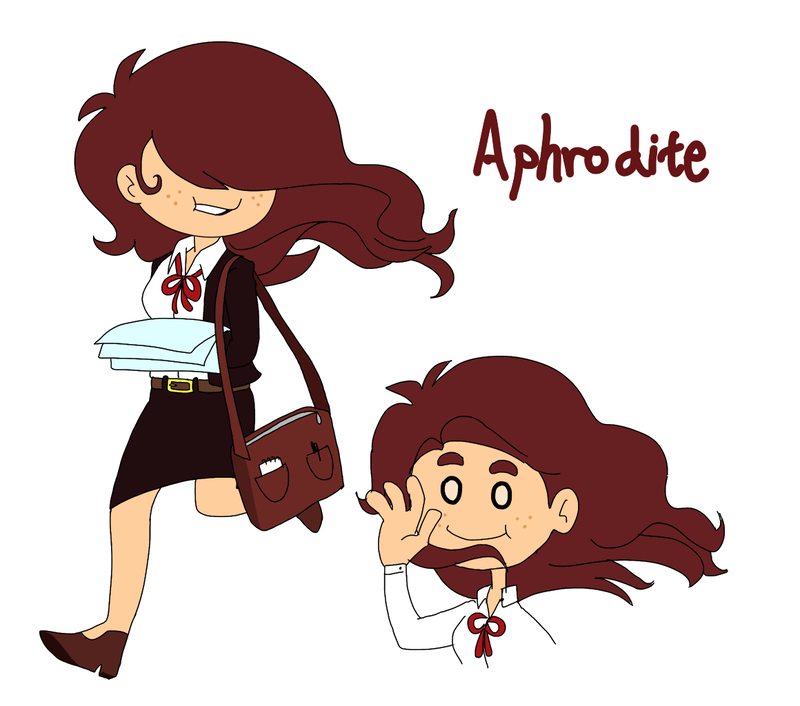 Aphrodite is Brody and Skyler's daughter.Her parents wished her to be an artist like them in the future.Unluckily,Aphrodite didn't do well in her College art exam.It doesn't matter,she luckily found another job,working in an art museum!There,she works as a guider,sometimes she gives out posters in order to spread the museum. 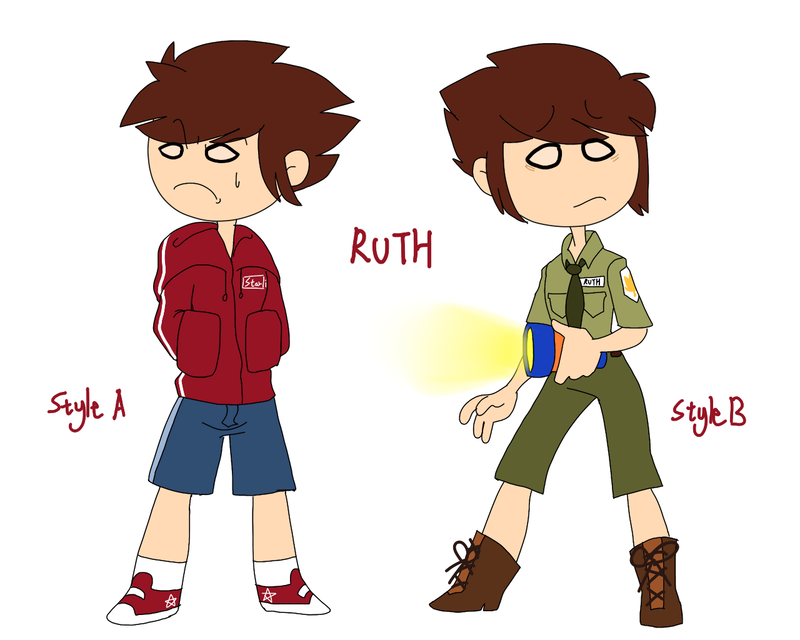 Ruth is a big fan of wild animals.Prudence's pet Pickle has grown on her,so she wanted to get a job where can contact with animals.She did it successfully!Now,Ruth works at a zoo on Maple Moutain as a zookeeper,even though she hates night shifts,but it never reduces her interests to animals. Akuma is Akari's nephew.During the school time studying acrobatics,he was a very shy and silent kid.Every time school was over,Akuma didn't play with other children,but look forward to seeing his favorite person,Akari.He found being a motorcyclist cool because of Akari.Afterwards,Akuma knew Chad.Chad always took cares of him.They became good friends.Now Akuma works with Chad as famous acrobats.Because of his job,he knows Alice,which is Akuma's super fan.Soon they become couples!In his spare time,he spends time riding motors with Chad. Chad is Boomer's dear nephew.When he was a kid,he usually spent most time with his daredevil aunt.Once,Chad was invited to watch Boomer's human cannon,from then on,being an exciting and excellent acrobat like Boomer became Chad's biggest dream.He joined an acrobatic school,started learning more about acrobatics.There,he met Akuma,who was also studying in the same school for being an cool acrobat.Soon they made good friends.Now Chad travels around the cities with his best partner Akuma,putting wonderful acrobatic shows to share fun with people.He also gives himself a stage name,Comet Con,which is only used when performing. 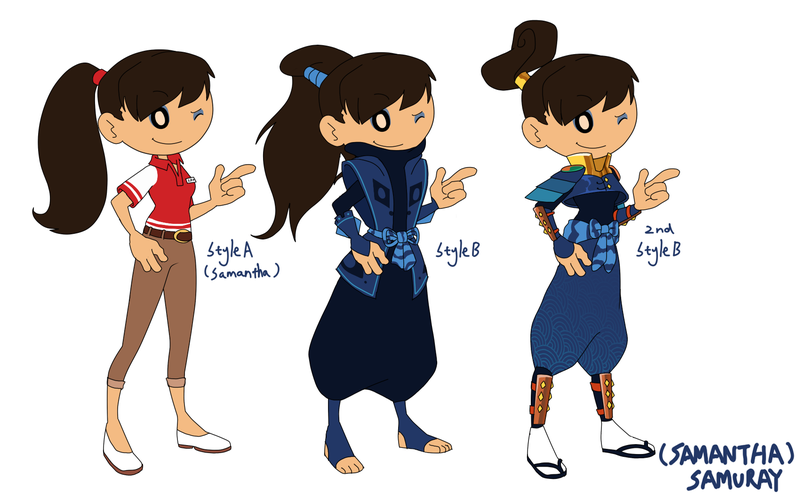 Samuray(AKA Samantha) is Ninjoy's only daughter.When she was a child,she always met bullies.Whether she got hurt or not,she always felt like doing something for Flipverse's peace.Ninjoy gave her a lot of life lessons,it inspired Samuray to be the same heroism like her mom.When she grew up,she customed herself a samurai outfit,disguising as a samurai and saved people from trouble.Even if she's regarded a real trouble. Rodney is a young guy who has high passion to soccer.He was born in a scientist's family,so he is as smart like his father.however,he isn't really into technological and futuristic things,but soccers.Since he was a kid,he crazily collected lots of posters and souvenirs of the current Flipverse soccer teams.Recently he is looking forward to meeting Alberto,because he not only admires his soccer skills,but also wants to move up himself.Because of his serious car accident,he used to be formed a machine prosthesis,but now he comes back to life,but still remains his machine legs. Jim is Timm and Quinn's son.He seems to be Quinn's successor,but he doesn't want to be a lawyer.With his hardworking,Jim made his dream archive--To be an excellent Judge of Tacodale.He is a very fair judge,every criminal case can be solved successfully,and there's no disagreement.Even though Flipverse is quite peaceful,he's still happy about his precious job.Sometimes,Jim has meals in Papa's restaurant,he's not very picky to them tho. 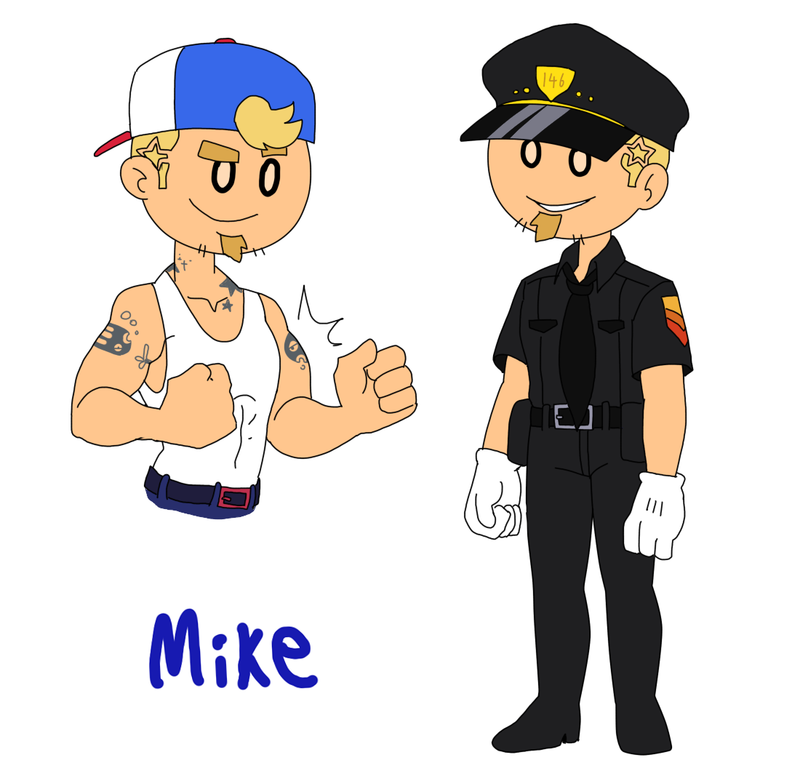 Mike is a warm-heart cop.He always wants to give the place where he live peace and quiet,so he started work at Tacotale Police Station.When Starlight BBQ/Jubilee comes,he goes to Starlight City to watch wonderful performances,and buys some powsicles for his summer break.Otherwise,Mike is Jim's best friend and bodyguard.Jim looks up to him a lot. Kelly is Duke Gotcha&Shannon's most favorite and proud daughter.Kelly's born in a family which works for News reporting,hence she has high skills on photography.Beware of Kelly!She is a person loves exploring and trying stimulating and fresh things.You may see her play with a skull called Skully sometimes,or maybe watch horror films,and so on..How can she be so brave?Because she works as a forensic medic. "I had to improve my bravery,or I would never be used to my current job. 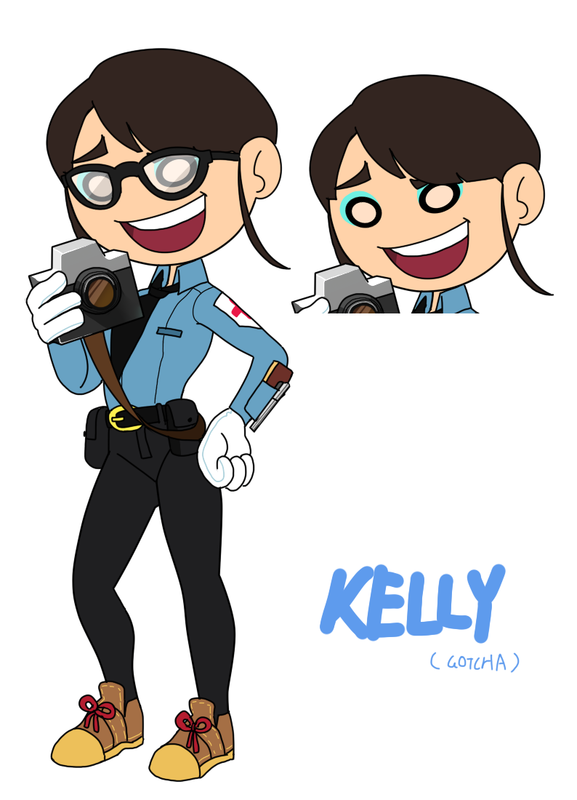 "Kelly built a police investigative team with Jim and Mike,all of them are hardworking being in such a team.They all look forward to getting new members. 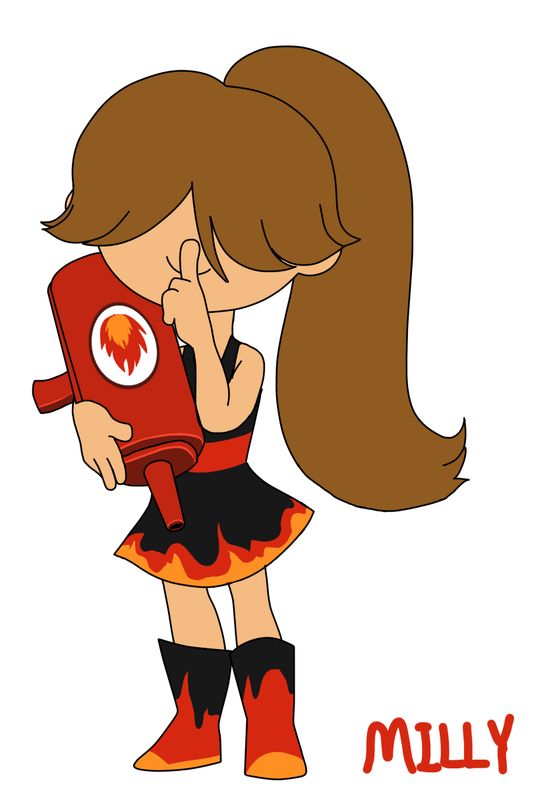 Laura is a 14-year-old girl who's has "Luau-Fever".Unlike how her parents used to be,she is very silent and unsocial.Laura doesn't want to cause any trouble,so she began to be a starchaser who liked Munchmo creatures.Finally,she found Luau LePunch fitted her flavor.A while back,Laura begged Radlynn for an amazing costume which is like Luau LePunch himself,and she just made it.In case of this,she is very obsessed with all kinds of summer season holidays,such as Summer Luau. 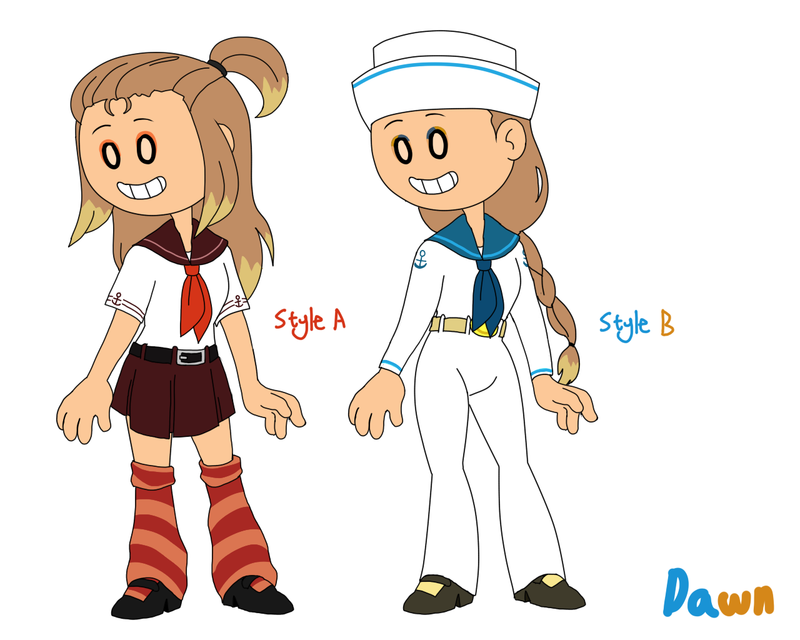 Dawn is an impish and playful girl that grew up on the Calyspo Island.In her childhood memories,she remembered James and Willow had to send her to Captain Cori's deck due to some unknown events.With Cori's cares,she became more interested in sea adventures and exploring.She worked with Robby when she's a teenager,even though Robby couldn't get used to a new skillful sailor very well,he accepted her at least.Finally,James and Willow got a opportunity to meet their long-awaited daughter on S.S.Louie one day. 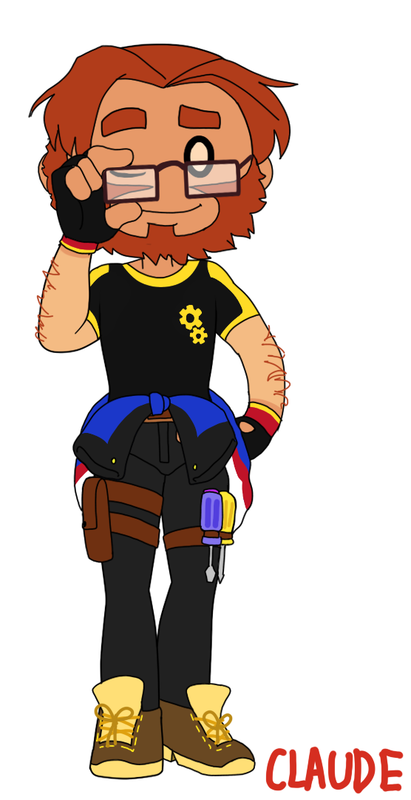 Claude is a hardworking mechanic,he helps his mother at Greasy Gear and working there.His repair skill is very excellent,he does very well in not only fixing cars but also ordinary machines.In his spare time,Claude hangs out with his loyal friends who always ask him for motorcycle maintenance,Akuma and Chad in Sakura Bay.Akuma told him there're lots of wonderful things cooler than them on Maple Mountain. 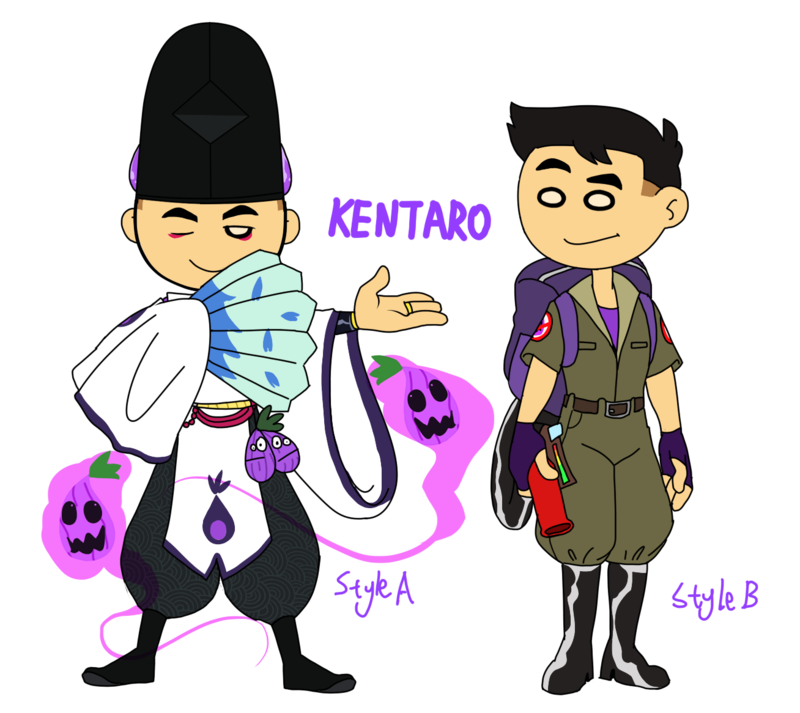 Kentaro is one of Tohru's child.He is very obssessed with spooky things.Kentaro is similar to Willow,he collects spooky toys,reads horrid fictions,and so on.At his age of 15,he accidently met the Onion Ghosts.Luckily the ghosts didn't hurt him,but from then on,they had grown on Kentaro's heart.Because of Tohru's Cherry Bloom holiday outfit,he regards he is supposed to make his own Japanese-ish outfit!Kentaro is becoming a better Onmyoji while he is working as a pro Ghostbuster at Mystery of Munchmore.Even if the Onion Ghosts are very cute for him,he still has to drive them away for flipverse residents' safety! 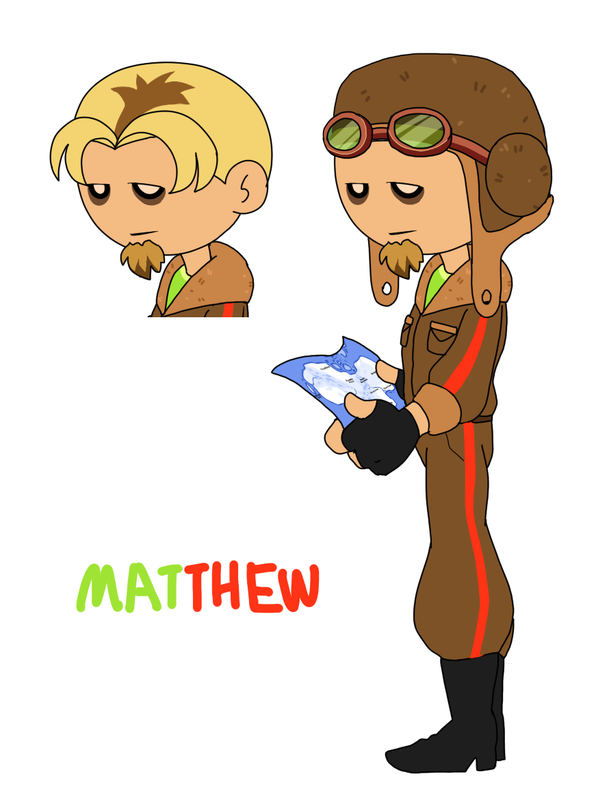 Matthew has a big dream,he hopes to travel around the whole Flipverse.He loves beautiful sceneries and natural things,but he doesn't want to be confined in Tastyvile.So Matthew looked for himself a kinds of transportation which is combined with hot balloon and airplane.Now he has already been to most of place of interests in Flipverse,and he wrote a biography about it.Akuma was very interested in his traveling stories.Matthew also has a little sister called Milly,he can't bear her annoying and naughty behaviors sometimes,but he loves her very much anyways! Milly is Matthew's little sister.She's a naughty troublemaker,and her temper is like a hot pepper.Don't be confused by her naive look,sometimes she can annoy you,and make you freak out.Milly likes making tricks on people who're regarded as her goals for making fun,and this is a headache matter for Mitch and Matthew.As for Maggie,believe or not,she always has ways to stay Milly calm. Florida is Chuck and Nevada's son.When he was young,he always came to Kahuna's store.By Kahuna's impression,he found surfing was quite interesting.After Florida learned how to surfing,he always invited Chuck to surf with him.Sadly Chuck shook his head and sighed,"Reeda,I am afraid I am not good at it at all,I might fall in ocean. 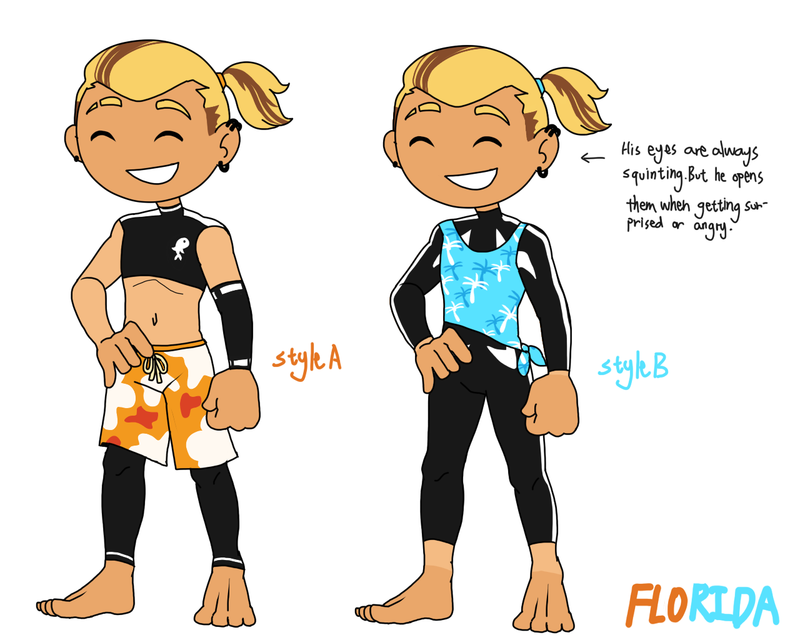 "Florida had no ways,so he challenged with Gremmie.Of course,he always lost the games with Gremmie,but he never gave up surfing.Day by day,Florida did more and more skillful on it,but he also discovered SAILING seemed much cooler than just surfing.Finally,he started practicing how to sail.Now Florida is a high school student,he won plenty of rewards for sailing/surfing games he participated.Nevada is proud of him,but Chuck is a bit ashamed that he doesn't play with his son often..
Randley is one of Radley Madish' proudest creations.He was made to reach Radley's experiment goal,which Radley wanted a stronger vegetable man to help him with taking off the Flipverse.However,Radley didn't realize,after the experiment root grew up,he've got a little radish baby!From then on,Radley started raising this kid,and soon,the kid was named "Randley","Randy" is for his nickname. 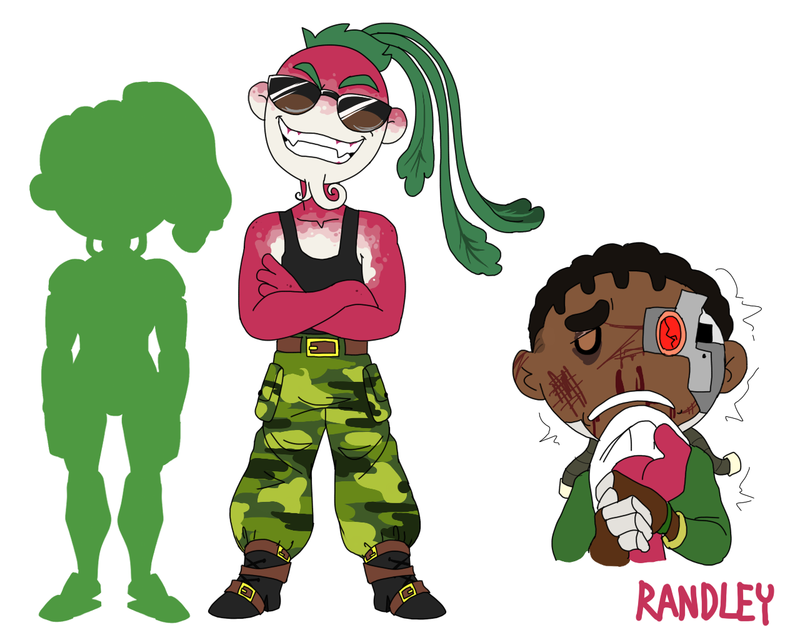 Years later,Randy grew up.By Radley's concept instilling,Randy's determination on helping his fathercreator take over the whole Flipverse became stronger and stronger.This made him even eviler.Very soon,Randy joint Sarge's army to work as an assistant.There,he wasn't discriminated by the onions,instead,he's highly appreciated by everyone especially Sarge for his incredible fighting ability. One day,Randy accidently touched one warp key in the lab.All of the sudden,a magnetic hole appeared and brought Randy to Flipverse.From then on,he has to stay in here and there in Flipverse.Due to Randy's horrible personalities,lots of people there were hurt by his bullyingEspecially Rodney.Thanks to Laura,a girl who discovered Randy on a farm,Randy got somewhere to live in.What to his surprise is,Laura signed him in Eclair Academy.Eventually Randy becomes quieter.But he still assures Flipverse will be taken over one day! Lola was born a talented singer.Since she was in primary school,she has been admired and loved for her beautiful and lively voice by many people.During her teenager time,she has taken part in many singing competitions,and she enjoyed the whole process of them.Lola isn't able to play any instruments,but it can't stop her fanatic from music.Afterward,she engaged in being a leading singer,like her most adored idol,Scarlett.Now,Lola has been in the music band which her twin sister,Julieta creates tunes for it.In Fudge and Furious,she is a glorious leading singer.From then on,Julieta presented a name for her rad sister,Rea Rhym. 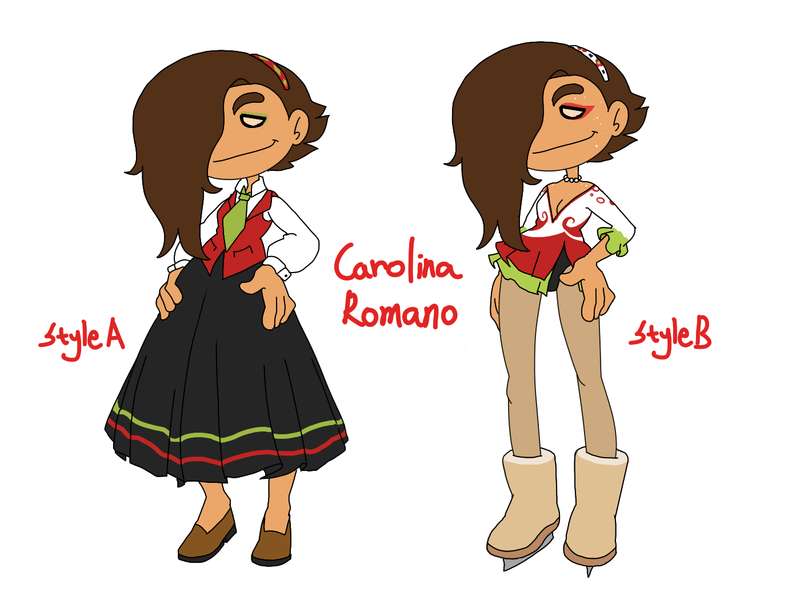 Carolina has been revealed her talented figure skating skill at the age of eight.From then on,in order to develop her hobby,the whole Romano family sent her for skating trainning.Now,Carolina is a professional and known skater.So far,she has earned all kinds of awards and admiration.Boys are having a big crush on her while all girls are being jealous of her prettiest beauty in the whole Flipverse.How excellent Carolina acts on the state.Despite in her daily life,she plays a quite picky,mean and arrogant role.Once Carolina sees somebody she might not like,she would make fun of him/her very badly.This is the only reason why Carolina doesn't have any friends,everyone she knows all dislikes her,including her enthusiastic cousin Knuckle and the most popular social butterfly Alice.As long as you're walking around Tastyville,you must see the lonely Carolina playing her panpipe in the park. 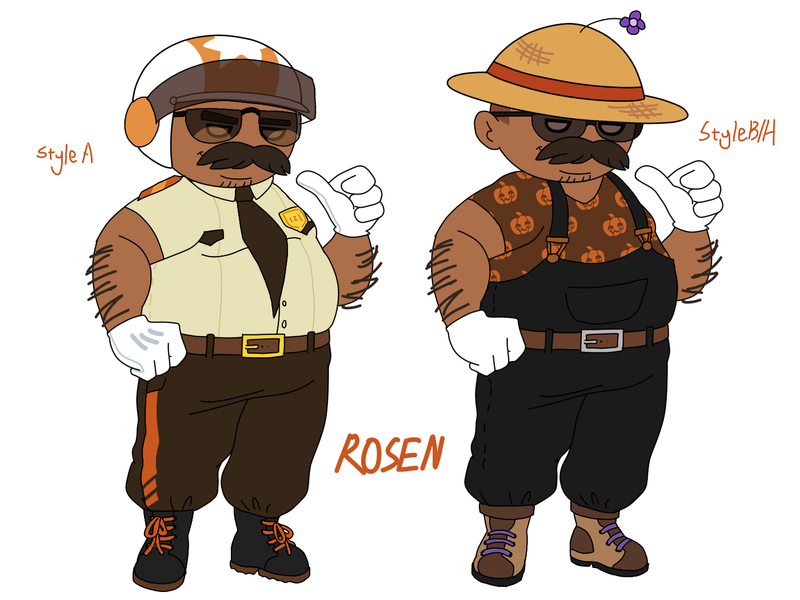 Rosen is the nicest,most helpful and honestest big man in Toastwood,the inhabitants adore him very much.As a vehicle fanatic,he can easily drive all kinds of cars.Because of this,Rosen became a motorcyclist patrolman,and he loves his current job quite a lot.For years' leaving from college,he finially met his old loyal friend again,Mike.By Mike's recommendation,Rosen decided to join the Gotcha Team Junior just for giving the team a free and fast drive.When Rosen has got nothing to do,he returns to his little village house to spend his free time,which his wife and his children are inhabiting there too. Everyone has his heart in beauty.Certainly,including Crabbie,a professional makeup girl who is also an expert at styling and dressing,is keen on making people beautiful.She appears to help celebrities with makeups,this makes her even more famous.On each party or occasions,she takes pretty much pride when people say the makeup is trendy and agleam.You can call her a fashion freak,but it wouldn't be appreciated for Crabbie to be called as "a lewd one".However,as a singer daughter who's risen by Cherissa,Crabbie is still struggled to seek for her biological father.Yet,couple years,the father of Crabbie is still a mystery. 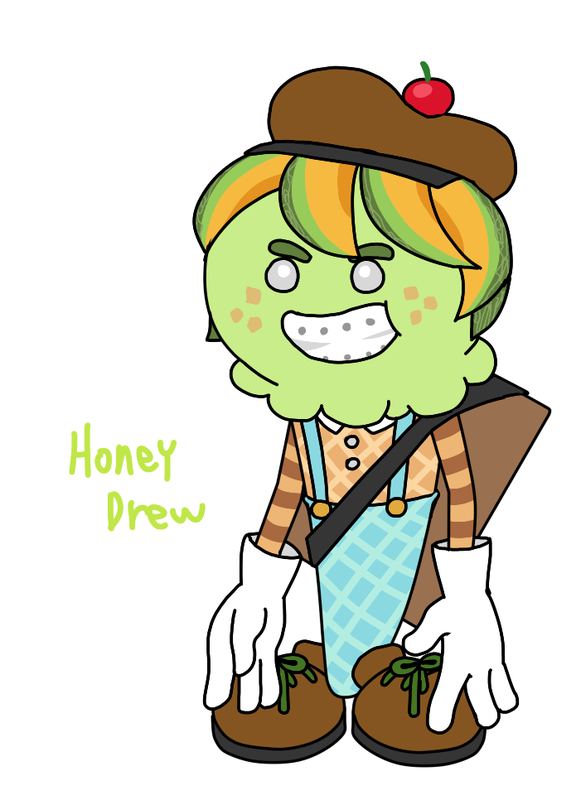 Honey Drew is a very wannabe comic artist,who also wishes to develop herself out of Neoplitown.After knowing the history of When Sundae Attacks,a new location she never heard before has grown in her heart.Even if she didn't have any chances to travel to there,she's still longing to take a glance there.Everyone in her school all disagree that it's impossible to reach the mysterious land,but Honey Drew holds the deep belief.Now she succeeded!Thanks to the warp keys from Rodney's family,she got to live in the place called...Flipverse!A few kids think she's quite reckless and sarcastic,however,it's pretty different for her roommate,Aphrodite to consider so.Aphrodite quite appreciates how Honey Drew pointing out people's mistakes and sharing her own opinions without doubts. 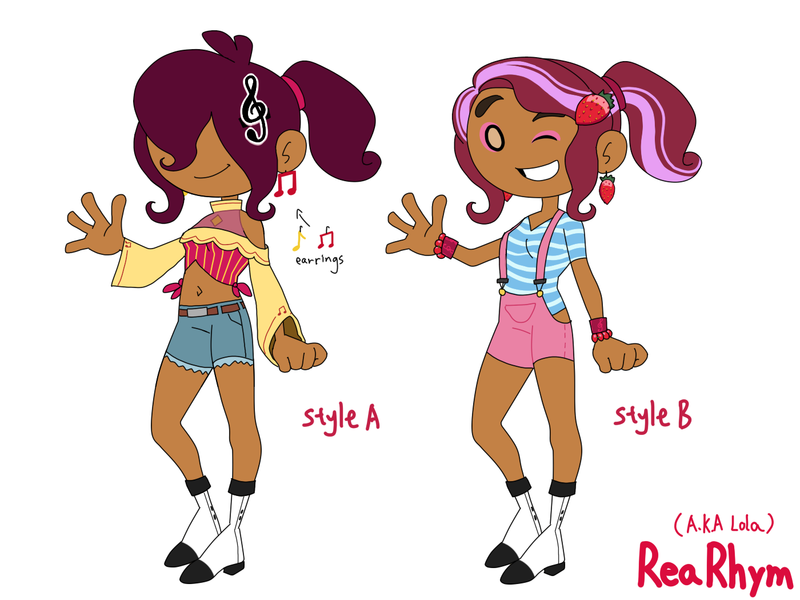 Try to make the characters' design more creative and special!Alright,for they're being fan children,I don't want them to look like just a clone or a copy from their original parents.However,it's okay to present the skills you use on outfits and hairstyles. 1.Try to give the nextgen a full family.What do I mean?I mean,they at least need parents..Yes,at least,father and mother?On this point,I want people to show their admiration on the shippings they love.If you really want to create a nextgen without one/any parent,I won't stop you..But it seems to be a pity.If you still don't have any good choice for who to be the another parent,you'll consider about it,till' Flipline reveals more customers. 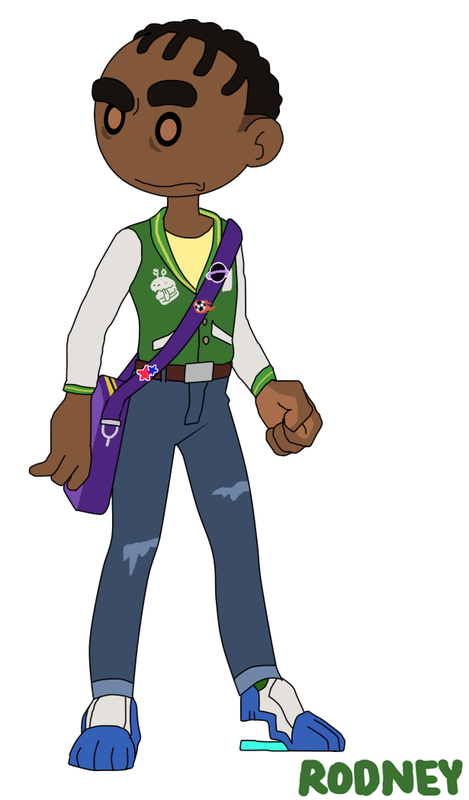 2.For those who make foster nextgens(which don't have any blood relations),it works as well!However,it might work as just an original character..
3.Nextgens like cousins/relatives make very much sense.Even if they might not have any known parents.For example,my Chad is Boomer's nephew yet child under her guardianship. 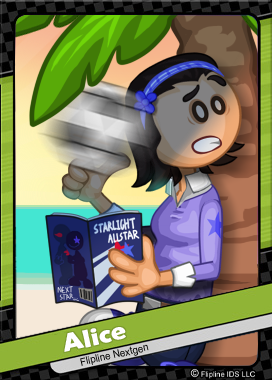 You'd better not create a nextgen of any Flipline characters,which their flipdecks haven't revealed AT ALL! That's a very good idea imo,but I'm afraid I won't do this shipping.My only rule is that I won't make any child characters of recently new customers,until they get a flipdeck! Ahhh that makes sense. 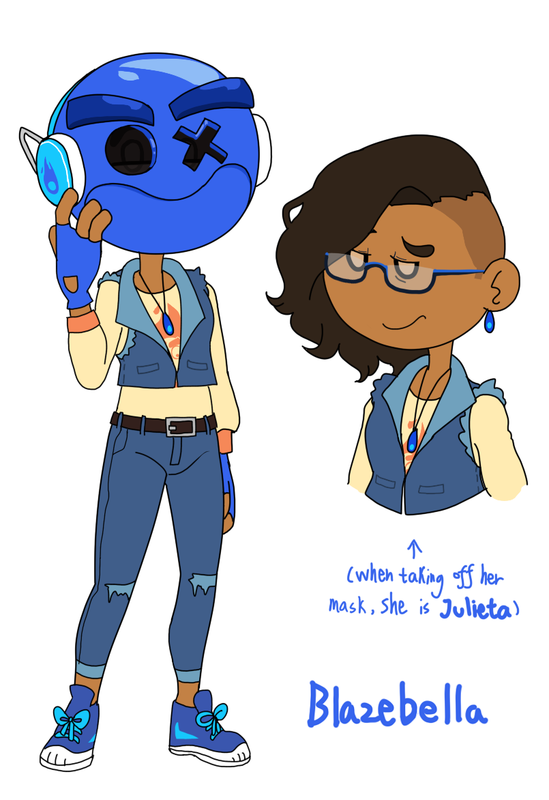 Then how about Hugo and Janana? Always acceptable!I will not only design their kid,but also have Blazebella know who her mom is.. I don't know,but I am sure there're 3 takes of her kids in the old topic! I know! Carlo and Julep!